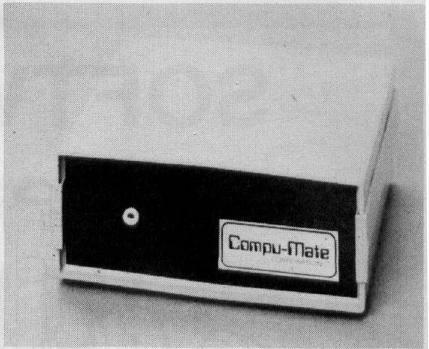 A new family of intelligent interface modules from Compu-Mate will enable the Atari 800 and 400 personal computers to accomplish many additional personal and business applications which, until now, were beyond the computers' capabilities. The first member of the new family is the Model CM-1000 printer interface. This unit includes one EIA standard serial port (standard synchronous protocol) and one 8 bit parallel port (Centronics compatible). Both of these ports are for use with standard serial or parallel printers, including letter quality. The unit comes with a simple customization program that allows the user to tailor special control codes for each port for use with many popular printers. The Atari 800 and 400 computers no longer need be limited to use with the Atari 825 or Epson MX 80 and 100 printers. Additional features include: standard baud rates from 300 to 38,400, bi-directional communications for use with modems, etc; software selectable port addressing; automatic powerup compatibility with the Atari 825 printer on the parallel port, and Diablo compatible printer on the serial port. The second member is the CM-1000/V. This unit includes the CM-1000 printer interface described above. In addition, it includes an 80-column video display generator. This generator enables the 800 and 400 computers to perform many functions such as full page width word processing and other tasks requiring an 80 column instead of a 40 column display. This display generator includes many other advanced features normally found on more expensive terminals. Additional features include: connects directly to the 800 and 400 video monitor ports; software selectable 80 or 40 column display; full 96 ASCII character set; upper and lower case characters with below the line descenders; reverse video; software downloadable character set; compatible with any video display capable of 80 columns. Features common to both interfaces include: no physical changes to computers required; both interfaces connect directly to the computers' standard serial I/O port; no cables to kludge out of the computer; both operate under DOS 2.OS and future DOS versions. One year warranty. The CM-1000 is priced at $289.00. The CM01000/V is priced at $489.00. A kit, (Model CM-10/V) to upgrade the CM-1000 to the CM-1000/V (adds video display generator) is available for $225.00.